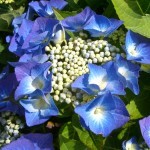 A broadly rounded shrub with flat heads of fertile indigo blue flowers surrounded by a ring of extra large, ray florets, forming a lacecap. The foliage is serrated and dark green. 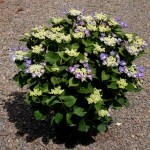 It needs moist soil and prefers partial sun. Remove old twiggy branches and prune yearly to encourage new growth and flowers.